RV Living FullTime...What is Your Excuse? RV Living FullTime...what's the downside? 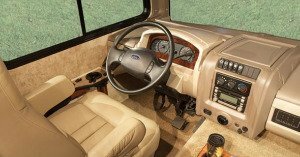 RV living full time is for you if you have thought your home looks best with a steering wheel in the living room. But is it all that great? Lets see. What if the unit next to you has a barking dog?...what if your dog barks? What if you don't like the neighbors? The solution to the above problems, and others like it, is simple. With a steering wheel in the living room, you move to another site or another park. 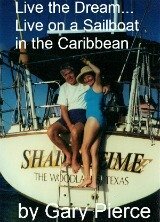 If the weather is bad...the same applies...trust me, somewhere the sun is shining, or the surf is beckoning. If you are flexible, RV living full time gives you all the flexibility you ever dreamed of. That is it's appeal, IMHO, your home moves with you. Remember it is your bad if you complain about weather, neighbors, etc. Somewhere it is nice and quiet, you are in control...I say again, you are in control. It is a super way to see the USA or Canada. A great way to visit...my favorite aunt said, "it is so nice to have guests that bring their own home"
It's pretty stressless...ever hear an alarm clock go off RVing?? Again you are in control, let's take a look at 2 scenarios. Here is the coach for the couple who just got to keep up with the Joneses. This 42 foot, dual rear axle, beauty will set you back about 600K+ new... it will depreciate 100K per year for the first 3 to 5 years. Here is a 36 foot Bounder. It took 30 seconds on RV trader to find. It is 12 years old, only 29,000 miles, and is listed at $18,000. I doubt it has any marble, maybe a cutting board. It will not depreciate at a rate of $100,000 per year. Somewhere in between these two examples is a coach perfect for you. A good analogy to use is a cruise ship. One passenger must have the best suite...Your humble reporter is content with the cheapest inside cabin. We both eat the same food, go to the same ports, see the same shows, etc. The difference is in what we pay, 10 to 20% of what Joe "Gotta have a suite" has forked over. 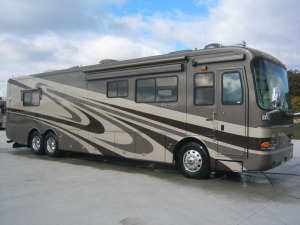 Same deal with RVing, both RV's above are capable of going to the Grand Canyon, the Oregon Coast, Alaska, and Key West. You will see the same scenery and enjoy the same sunset. Folk's there are some people who say "I will retire when I acquire this RV, or certain amount of money, not before". OK, fine...but they are swapping years for dollars. Please don't let this be you. Would you rather be in an RV like the above Bounder (which anyone can afford). Or are you going to wait until you can buy the 42 footer and watch it depreciate $100,000 a year? 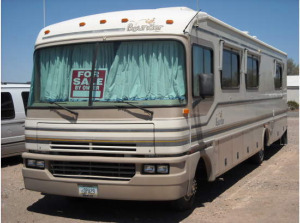 The RV living fulltime is a lifestyle anyone can enjoy now. So can you.